Shares are surging after catching a bid at a key level yesterday. The Tesla Inc. (TSLA - Get Report) trade is on this week. Shares of Tesla were up more than 5% Tuesday morning, surging for a second straight session. The big driver today is go-private speculation on news that Morgan Stanley has discontinued rating Tesla shares. Analyst Adam Jonas has been one of the loudest pro-Tesla voices on Wall Street in recent years. Now, MS has pulled its rating on the company. Investors are speculating that the surprise move could signal that Morgan Stanley is getting involved in advising Tesla in its going-private deal in some capacity. From a technical standpoint, though, Tesla's bounce higher this week isn't completely surprising; despite all the noise from bulls and bears this summer, this stock remains extremely technically obedient. 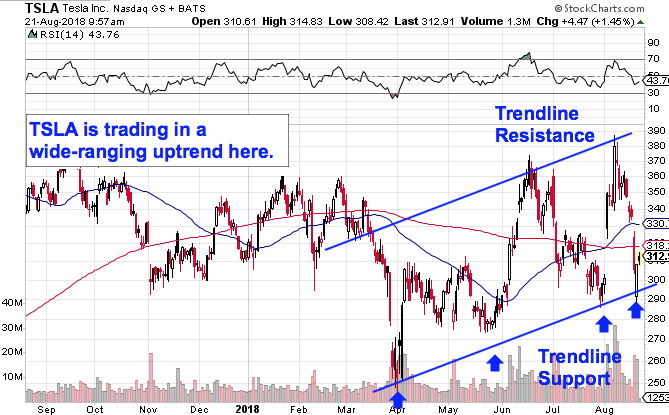 Since selling off back in early April, Tesla's price setup has evolved into a well-defined (if wide-ranging) uptrending channel. So far, the last four tests of trendline support have provided attractive buying opportunities. We're seeing the fourth support bounce play out this week. As an aside, it's also worth mentioning that many Tesla-watchers have talked about how shares have traded relative to the stock's 200-day and 50-day moving averages -- those two levels have had zero technical relevance for the last year. Traders can completely ignore them in 2018. 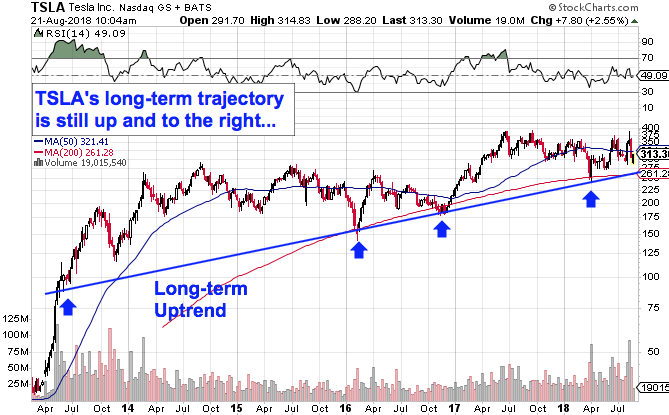 This weekly chart of Tesla's price action since mid 2013 shows that shares have actually been in a very well-defined uptrend over the long-run, and that trend continues to be in play today. April's support bounce looks very similar to the similar bounces Tesla made back in February 2016 and November 2016; Tesla is up around 130% from its lows that year. That's not to say that Tesla is without risk here. Headline risk remains extremely high for shares of Tesla, as the company remains at the top of the news cycle. Between short-sellers remaining entrenched in shares (27.6% of Tesla's float remains short here) and Musk and company vying to take the company private, the odds of a positive or negative surprise moving the stock materially remain very high. But, for investors who already want to build a position in Tesla, we're staring down one of the most attractive buying opportunities in 2018.